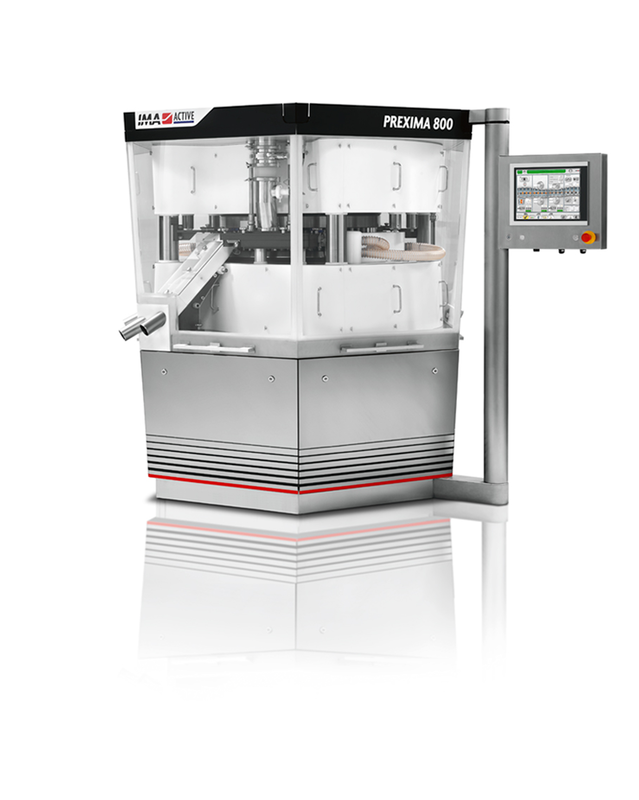 Protina chooses Prexima 800 to win the challenge of producing top-quality bilayer tablets while keeping production speed at maximum. In the last decade, interest in developing a combination of two or more Active Pharmaceutical Ingredients (API) in a single dosage form (bilayer tablet) has increased in the pharmaceutical industry. For a variety of reasons: patent extention, therapeutic optimization, marketing to name a few. Bilayer tablets offer definitive advantages over conventional monolayer tablets. For instance, bilayer tablets are commonly used to avoid chemical incompatibilities of formulation components by physical separation. In addition, bilayer tablets have enabled the development of controlled delivery of active pharmaceutical ingredients with pre-determined release profiles by combining layers with different release patterns, or by combining slow-release with immediate release layers. The design of modified release drug production is usually intended to optimize a therapeutic regimen by providing slow and continuous delivery of drug over the entire dosing interval whilst also providing grater patient convenience. Bilayer tablets can also improve patient compliance by reducing the number of daily doses required and simplifying regimens. But with the many advantages of bilayer tablets come the challenge of successfully producing them on the tablet press. While the principles of making bilayer tablets are similar to those of monolayer tablets, these drug delivery devices are mechanically complicated to manufacture and harder to predict their long-term properties. Examples of these challenges include using the appropriate instrumentation to monitor and control force, keeping the APIs separated to avoid cross-contamination, and preventing excessive waste of material due to incorrect press setup. To reduce capital investment, quite often existing but modified tablet presses are used to develop and produce such tablets. The development and production of quality tablets need to be carried out on purpose-built tablet presses to overcome common bilayer problems – such as layer separation, insufficient hardness, inaccurate individual layer weight control, cross-contamination between the layers, etc. Using a modified tablet press may therefore not be the best approach in producing a quality bilayer tablet under GMP-conditions. IMA and Protina have joined forces in order to win the challenge of producing top-quality bilayer tablets while keeping production speed at maximum. Which are the criticalities of bilayer tablet manufacturing? In particular, which is the main criticality of your product? One of the major challenges while producing bilayer tablets is the lack of sufficient bonding and adhesion at the interface between the adjacent compacted layers, which may not always be apparent immediately after compaction. In addition, if the compacted layers are too soft or too hard, they will not bond securely with each other which can lead to compromised mechanical integrity. Other challenges during development include establishing the order of layer sequence, layer weight ratio, elastic mismatch of the adjacent layers, first layer tamping force and cross contamination between the layers. These factors, if not well controlled, in one way or another will impact the bilayer compression PER SE and the Critical Quality Attributes (CQAs) of the bilayer tablets. In our case, the very abrasive rate of our product made the challenge even more ambitious. Which was the most restrictive requirement for the new tablet press machine? The purchase of the new tablet press machine is part of a more comprehensive project which will lead us to replace, within several years, the major part of the old machines now installed in our plant. The most restrictive requirement in choosing the new tablet press machine was space saving: due to our room layout, we needed just one outfit to manufacture both mono and bilayer tablets. In a sense, the first time we attended the performance of Prexima was the result of a coincidence. We were carrying out a preliminary test of an Adapta capsule filling machine when we saw a Prexima 800 running at full speed. Due to its compact design, we believed we had found the tablet press suitable for our needs. We worked closely with IMA Active team to optimize the machine configuration according to our requirements. A special conveyer was fitted inside the processing area in order to make the product convey to a single exit chute. As a result, the overall footprint was further minimized by connecting the machine to a single deduster with combined metal check. Fast changeover was another strong point: on Prexima, switching from mono to bilayer tablet production requires less than one day. The full switch is performed by removing just six major components and leaving the turret installed on the machine. All of this is fundamental for those who focus on flexible and highly differentiated production – as we do. Nothing new from this project with IMA: as always, the quality we need in the time we need. The close collaboration with IMA Germany makes the difference for our choice in partnering. At every step of the project, we have appreciated IMA’s positive attitude: both the technical team and their management showed great willingness to collaborate with us. It has been just four weeks since we saw Prexima 800 for the first time when we finalized the order. We have recently carried out the Facility Acceptance Test for an Adapta 100 with 100% control of gross weight. Dosing precision, flexible configuration, easy inspection are the hallmarks of this machine which is unique in the market. Other ongoing projects by the end of 2018 will confirm again IMA as our trusted partner for Solid Dose manufacturing.